The day’s events began at 8:30 a.m. with an open gathering at the flagpole at Dupont Court. The MIT community joined President Charles Vest in the ceremony to lower the US flag in Killian Court to half staff. This event ended at 8:46 a.m., marking the time at which the first plane collided into the World Trade Center. Also at this time, MIT Chapel bells chimed in unison with bells throughout Cambridge. “This is a great start to bring all the Greek organizations closer together considering the less than impressive interaction between them in previous years,” said IFC member Bruce Au ’04. 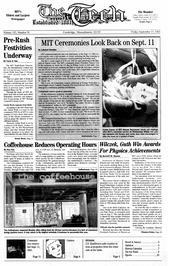 Declining sales have forced the Student Center Coffeehouse, formerly open 24 hours, to reduce its hours of operation. The Lorentz Medal in physics is awarded every four years by the Royal Netherlands Academy of Arts and Sciences. The prize has a prestigious history with past winners including Max Planck and Wolfgang Pauli, both of whom later won the Nobel Prize in Physics. The award is in honor of Hendrik Antoon Lorentz who won the Nobel Prize in 1902 along with Pieter Zeeman.